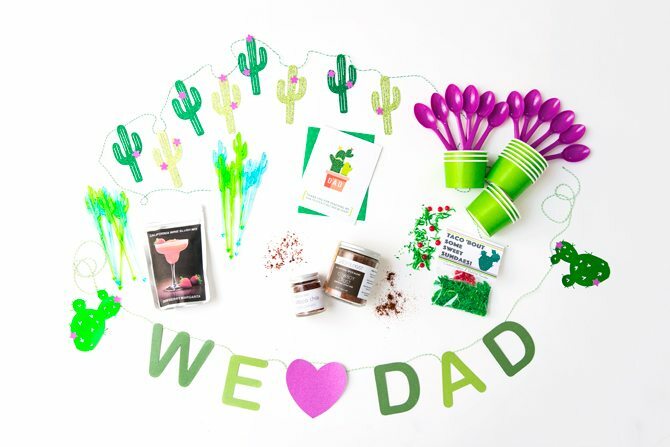 The adorable cactus banner that made our hearts skip a beat. Glittery and sweet, this banner can be used at any summer party! This adds a layer of fun to your celebration. It turns a fun summer party into a Dad Party! Ice cream makes everyone happy. We included some green ice cream cups, purple spoons and some toppings to make taco sundaes. Can’t get enough of this cute card for dad. This card sums up Dad pretty well. Open a big jar of Spiceologists popular rub, Cowboy Crust. Check out our amazing recipes. Follow the directions to make a wine slush Margartia. Yum! This is a totally amazing box and one of my new favorite subscriptions. Tinselbox absolutely does a ton of work curating perfect party items that are stylish and fun, and combines them with tips and hints throughout the year. Everything was really just gorgeous and well-coordinated … I both agree that the large box is where it’s at, although the smaller box is still cute and fun, we love getting the additional items. If you like adding a little cheer all year long with a celebration we highly recommend this subscription!